A question was posed on my instagram page regarding the yoga waistband, and thought I'd share it here. The yoga waistband is another one of my recent loves, which I have mentioned here and here. ComfortWear is my new mantra for a working woman-on-the-go. The formula is just perfect for my work life... Office appropriate + cozy + versatile = comfortably perfect. The yoga waistband makes wearing a skirt even more comfortable and I don't think it gets better than that. Seriously, it makes that time of day, time of meal, time of life bearable. I've mentioned many times, my week days are 12-15 hours long and sitting for long periods of time begs for more comfort. 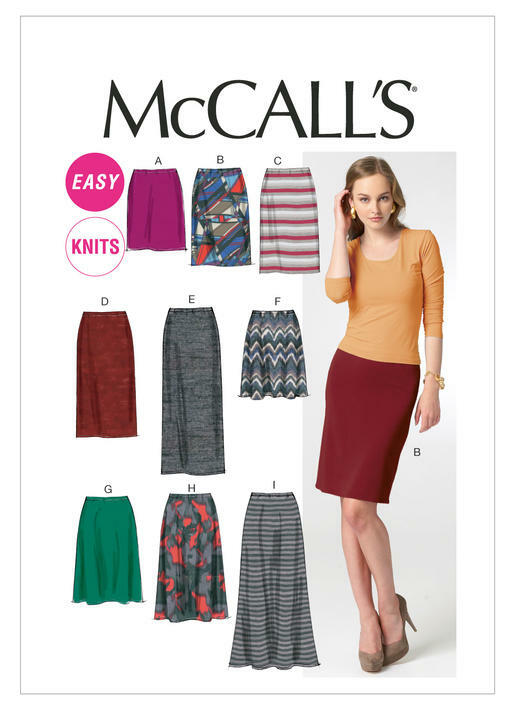 I used Mccalls 6654 knit skirt pattern, size 10 and constructed the skirt as directed. Used a printed ITY knit from Chic Fabrics, NYC. For the yoga waistband I used the casing pattern piece. That piece is about 1-1/2" in height and added an additional 1-1/2" to that , yielding a 6" yoga band, and cut my waistband on the fold. 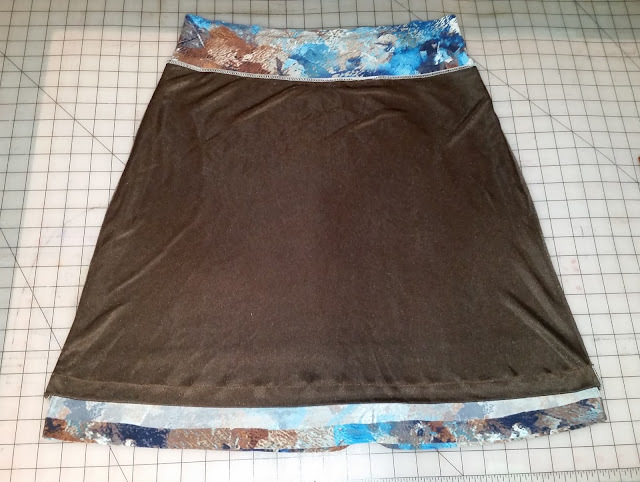 A lining was added to my skirt and used the skirt pattern pieces to make the lining. Basted the lining in wrong sides together to the skirt wsist line. Before serging the raw edges of the yoga waistband, I cut 1-1/2" from the band length, then serge. Once serged, I tried on the waistband to ensure it fits snuggly on my waist. Folded the yoga waistband wrong sides together and machine baste. Thereafter, pinned yoga waistband to skirt waist stretching as I pinned to accommodate the waistband to the skirt waistline and serged. All that remain was hemming the lining & skirt... done. The yoga waistband is easy to add to any skirt pattern may it be knit or woven. 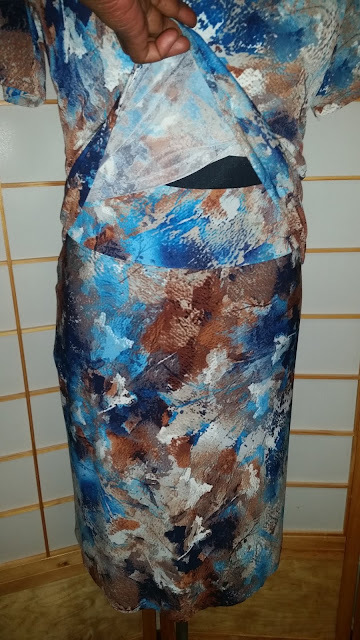 For this version, I cut a printed cotton blend fabric on the bias as well as the yoga band. Again, I reduced the length of the waistband, but allowing enough room to slide it over my hips. Serged to skirt, hemmed lining and skirt... done. What exactly is a yoga waistband? And what's your Instagram? I love that idea, and I'n going to be making my knit skirts the same way from now on THANKS!!!! I will be adding the yoga waistband to my next skirt. What a great idea ! Thank you for sharing. 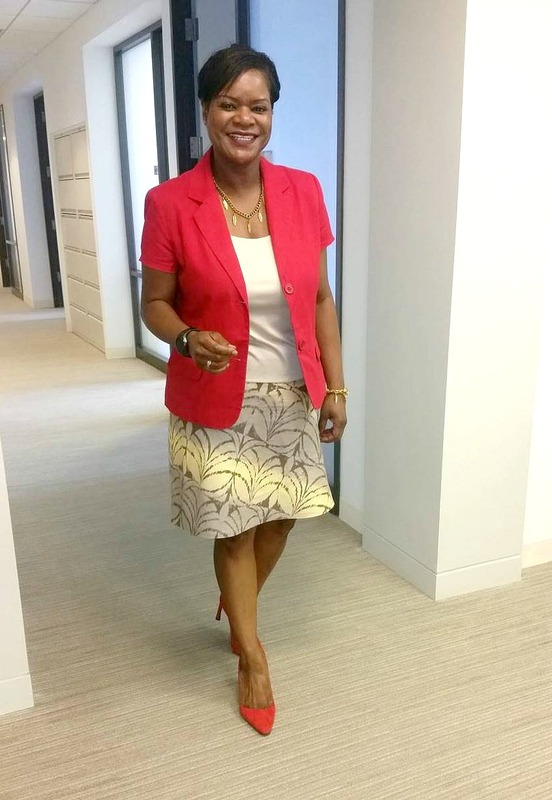 It's always amazing to see how you make versatile garments for the office. Thanks for sharing your waistband method. I am loving what you are doing with the 'twin sets'. I am curious, if you wouldn't mind saying, what you are using for the lining in the knit skirts? And you mentioned ITY for one set, are all the knits ITY? And how was the wearability/comfort of the woven on the bias? I know, lots of questions....that is how much I am liking this idea! Thank you. Definitely do it... love it. Thank you Garnet128 and questions are always welcome. For the lining I used 40" denier tricot fabric. 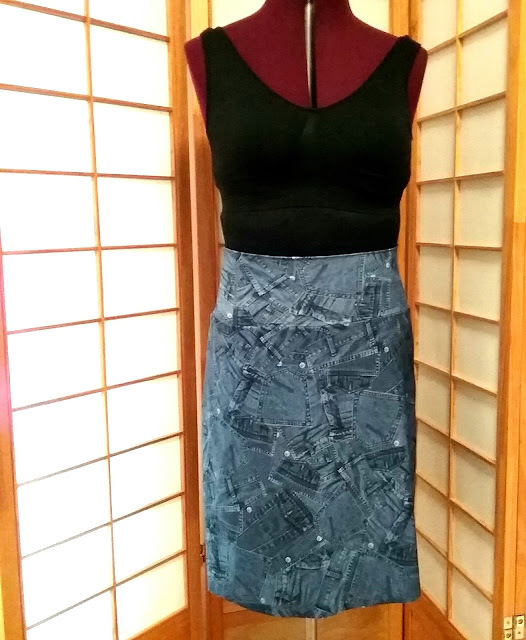 The denim print is a poly/spandex and the black/grey print ltwt poly/lycra. The wearability of the woven skirt was good, however, the waist band stretched and I will need to add darts for a closer fit. Thinking for the next woven skirt I will add a knit color coordinated yoga waistband. Your outfits using this pattern look spectacular. 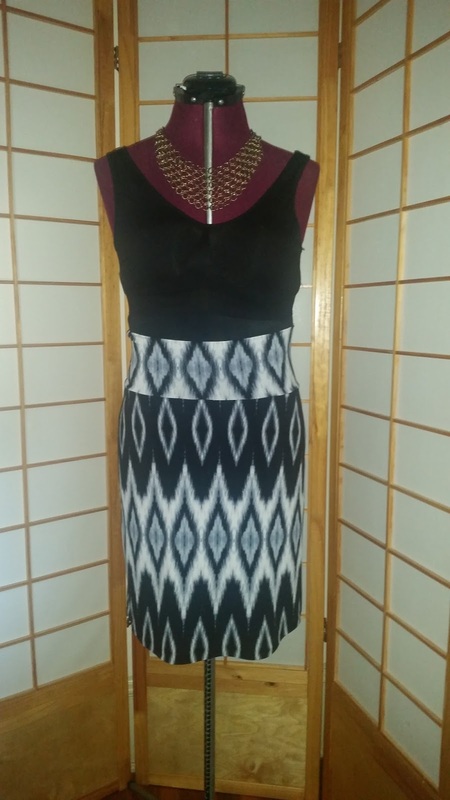 The matching two pieces really look like a dress but you have the versatility of separates. Win win. About your yoga waistband - I find I can't use one because my waist to hip ratio is too large (at least 11 inches) and I can't imagine a pull-on woven yoga band even on the bias! But the finish for yours is perfect. Thank you Carrie. I beg to differ on you being unable to wear a yoga waistband skirt. You can cut the waistband a lil shorter, maybe a 2" height. 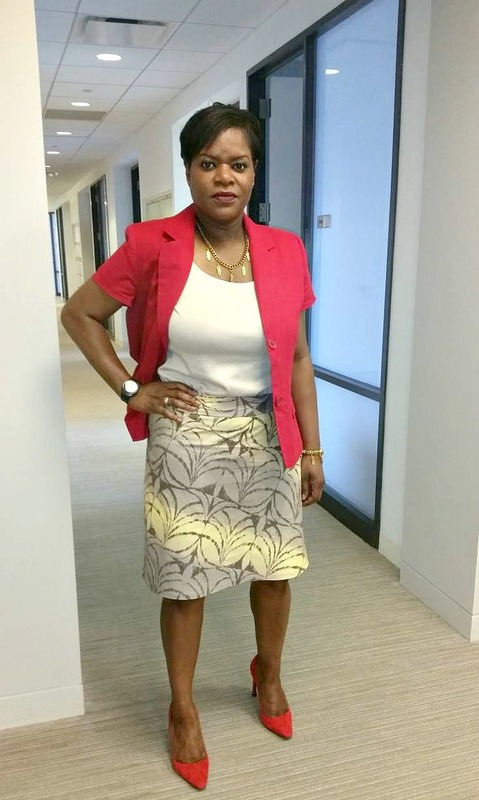 I rarely wear my blouse tucked in and like to think of the yoga waistband as my tummy smoother. I like the comfort & smoothing factor it provides. You can rock it... go for it. So there is no elastic in the waistband? Do you have to use a zipper for woven fabrics? This looks very interesting, will have to try it. Correct there is no elastic in the waistband of the skirts. For the knits, I cut the waistband parallel to the stretch of the fabric. For the woven I cut the fabric & waistband on the bias creating a lil stretch and did not use a zipper. Reduced the circumference of the waistband and was able to pull the woven skirt over my hips. However, the waistband on the woven skirt stretched a tad bit more during wear, causing it to sit lower on my waist. So for my next woven skirt, I will go with a knit waistband. Hope this is helpful. Thanks for the info, Sheila. I've used this waistband before when a pattern called for it, but will consider the adaptation with other patterns. Your new photo looks great, an organized dream sewing space! Thank you Patty ! The desk was a throw away and scavangered by my brother & given to me... in perfect condition.. yippee! Thank you Sheila for posting all the details on the waistband!! I really appreciate it. It is on my list of things to try this fall with a few skirts I want to make.